For this review I actually went out and got a Steigl Grapefruit Radler to compare with, even though beer is gross, because I couldn’t quite believe how much this grapefruit cider doesn’t appeal to me. Perhaps grapefruit and apple is just inherently a bad combination, but I don’t think that’s necessarily true without additional data points. Instead let’s chalk this up to a learning experience for Schilling, a new local company I’m otherwise fond of — their Oak-Aged is one of my go-to ciders and will show up in a later review. 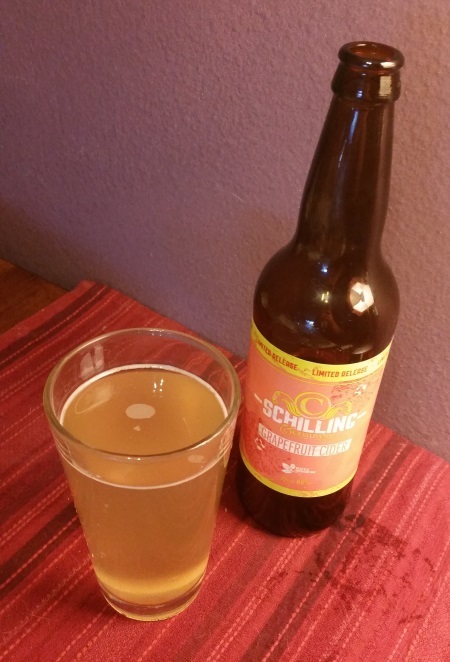 Schilling’s Grapefruit Cider is a cloudy pale yellow and has an ABV of 6.0%. Schilling seems not to acknowledge that this cider exists anywhere on their site, so I’m not sure where you can find it — in my case, it was at a small deli/convenience store that opened up just down the road from where I live. This entry was posted in Cider and tagged grapefruit cider, limited release, schilling cider. Bookmark the permalink.